On November 16, 2003 Niki and I received a mail from a Thomas Moore telling that he has pictures of our Maryland Family members. 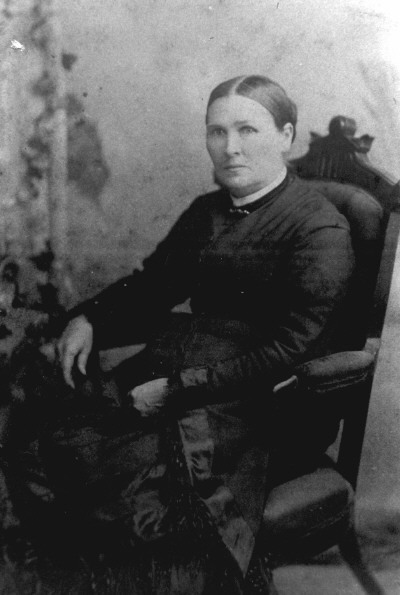 I jumped to the links provided in the mail and found pictures we already had on the US Family Site with the exception that they were sepia colored (they are said to be "Ambrotype") instead of white and black. The family decided to contact the seller. I have decided to put on this pages the mails sent both on the Cavey Mailing List and the US Cavey Family Site. Note that to avoid the pages on the eBay site to be removed a day or another I've downloaded them on the Cavey.org site so that you can continue to look at them. Nevertheless, I cannot guaranty that the links inside the two pages are still alive. Note that there are differences between the three series. The pictures from Bill (on the left) look like if been resized in comparison to the ones on the right. The cutaway of Frederick King has been cut at the bottom of the picture. The dress of Mary Ann Bowers also and the leg of the armchair she is sitting on as well. The arch of the wall behind Nathan Cavey and Mary A. Frost Cavey has been cut at the top of the picture from Bill. The picture of William J. Cavey has been centered too. Added to the sepia color (Ambrotype), this makes me thought that the originals are those of the eBay site. (Paris) 31 December 2003 All! All of them have been sent to Bill. I hope he will receive them and give me some feedback. As previously said, I will no longer bid on Caveys items if I do not know who are the person pictured. I suggest that you send a mail to the seller, Dennis Wheeler (sportsink99@hotmail.com), and ask him if he has a larger picture scanned. Take care that auctions ends on 12/28 . Also, did your father tells you something about Norman Cavey and William Rose ? It is probable that there is a close family link between Norman Cavey and Gilbert Cavey (the one who is pictured). Merry Xtmas and Happy New Year. I have written to you before about the Caveys in Maryland. My grandfathers name is Gilbert Cavey and he was in the war. I am unable to see the picture large enough to tell if it is him. Is there a way to enlarge It? (Paris) 21 December 2003 Who are these persons ? William Rose is already quoted in the picture of Beatrice Cavey. (Paris) 21 December 2003 Below is a mail I've recived from Dennis Wheeler. Don't know if the picture is from the same batch that the previous and if this baby is related to Bill. I yes, this will confirm that the pictures he has in hand are from the Bill familly branch. Also, I gnore if the Norman and Gilbert Cavey are known of the Marylanders Cavey. It should be great if one of you could join Bill's daugther by mail so that she can help us to decide. I understand your trouble but, in my humble opinion it's not a good approach. 1- Are the pictures owned by Dennis Wheeler the originals and, consequently, are those owned by Bill old copies ? My answer is "yes", they are. 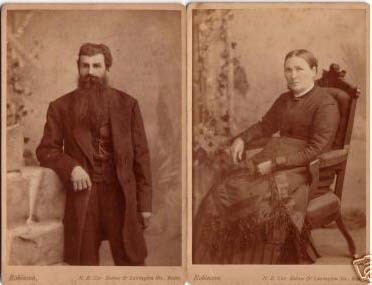 pictures on the eBay site are sepia colored an appear to be Ambrotypes (i.e. Daguerroypes). each picture on eBay have the name and address of the photographer at the bottom. the pictures from Bill have been resized in comparison to the ones on the the eBay site. They are recentered from the originals. This can be done in that way (eBay => Bill). This cannot be done in the reverse way. this is to be confirmed but I guess that the picture on eBay are printed on a piece of millboard. We have such pictures in my family. I assume that Niki, who has scanned the Bill's pictures, will be able to confirm that his pictures are printed on glazed paper or something like that. As I already wrote, it is very possible that Bill got these pictures from his parents without knowing that they where not the originals but copies (re-prints) made in the early 1900's. 2- Who is selling these pictures ? My guess is that it's not Bill. If they were owned by Bill, Niki would have seen these pictures when she scanned them for upload on MyFamily.com. My first approach was that they were owned by a far cousin of Bill. Since yesterday, because there is a Virginia and a Beatrice Cavey on two of these pictures (taken in the 1940's WWII), and also, because there is the Bill's Grand-Father (William J. Cavey) on one of them, my opinion is that they were owned by a closer cousin of Bill. Only Bill or his daughter can shed this point. The main concern is to learn who are Virginia and Beatrice. This will help us to trace the one who have sold the batch to Dennis Wheeler. the owner has some financial difficulties and has sold to Dennis Wheeler the pictures he don't care. the owner may have passed without descendent. the descendents of the owner may ignore who are the persons on the pictures. Have in mind that Bill is, first of all, a Norris. Bill is involved by genealogy. This is not necessarily the case for his cousins and their descendents : they may ignore who are the Caveys. 3- Could the pictures we put on our sites be filched and reproduced without our agreement ? The answer is "yes, they may". But, at first glance, it would be difficult and expensive to make the copies Ambrotype-like. The price for fake pictures would certainly not be $9.99 each. 4- What would we do ? My suggestion is that we must first try to contact Bill and / or his daughter and make them aware of the story. As soon as Bill receive the samples I have bought, have a look on the paper on which they have been printed. Is it thick or thin ? Does these pictures look very old or not. Compare these pictures to the ones owned by Bill. Ask to Bill Norris if he has some idea of who are Virginia and Beatrice. Are they known cousin of him. If yes, does he have an idea of who may have had these pictures beside him ? This is my thought at the moment. I don't understand what is happening. I pulled my family pics off of the web page cause I don't know if someone has taken them and is trying to sell them. Could it be possible that Bill needs money and is selling them? I honestly don't know what to think! I've bought the items #3261487055, #3261485632, #3261487498 you put for auction on the eBay site. This time the situation is more complicated than the previous one. 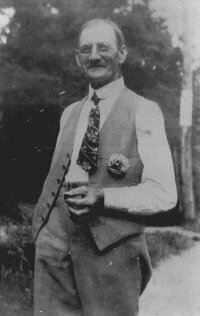 William J. Cavey (#3261487498) is a well known ancestor of our US familly branch. On the other hand I have not idea of who are Virginia and Beatrice Cavey. I'm waiting to learn from my US cousins who they are. In any case these pictures will stay in the US (Baltimore MD). So, I would appreciate to have the costs of USPS for shipping from Chigaco to Baltimore. I shall Pay via PayPal as soon as you give me the total amount to be paid. I shall tell you later the exact address where to send them in Baltimore area (I'm away from my home the next week). However the story has not end with the recent auctions. they will stay in the family. 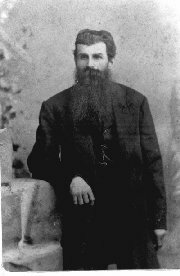 The first item is the picture of William G. Cavey we already have on MyFamily.com site as well as Caveys Family World Wide Society.
" William James Cavey, son of Mary Ann Frost Cavey and Nathan Cavey. 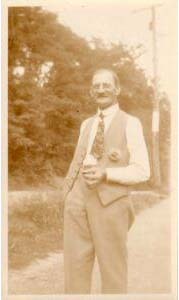 (Bill Norris"s Grandfather)"
The picture has been uploaded by NiKi on Apr 22, 2001 and is owned by Bill. I shall again ask for this picture to be delivered to Bill. On the other hand, I have no idea of who are Virginia Cavey (with Georges Miles) and Beatrice Cavey (with William Rose) who are on the two others items. If you identify them as members of your branch, let me know. The seller is once more Dennis Wheeler at Chicago. My suggestion is that several of us put the eBay site on survey to verify that the pictures related to us are actually Caveys. I have set up an alert on my "favorites" tab on "my eBay" page on the site to receive a mail each time the word " cavey" appears in the subjet of an item. My thought is you should do the same thing on your side. It is important to verify that the Cavey pictures are of known persons : the two pictures I already bought plus the one won by an other Cavey plus the above William, all come from Bill branch. Are Virginia and Beatrice also from the same tree ? It's probable. Has a parent of Bill sold his whole family album to Dennis Wheeler ? Could Bill or his daughter give us an explanation, or, at least investigate ? Could Sharon and Niki try to better understand what's happening ? Thanks for the help : it's difficult to deal with this issue from Paris. Also, I have not plan in my 2004 budget to buy the pictures of the whole US Familiy even if at the moment 1.20 USD = 1.00 EUR. Thanks so much for watching out for us, your long lost cousins!! We really appreciate it. I think that was really great that you sent them to Bill. That was very nice. Let's hope no more of our family pictures show up on ebay! Have a very Merry Christmas and a Blessed New Year!!!! I have won the bid on the King pictures. I shall give the Bill's address for delivery. Hope he receive them for Christmas. The two other pictures also stay in the family. (Paris) 15 December 2003 Thanks ! When I list them all I can give is the info I have. I'll let you know if some of the future pictures have info included as far as cavey ect that I have. I'm looking for pictures of the Cavey family not by pictures of "unknown soldiers". Also, I visited your items listed in your eBay store. None of them are explicitly Caveys. I understand that you got them in the same batch but this does not imply that they are from the same family nor that they are Caveys. They may be friends of the person who sold you these pictures (or his/her descendents). [Note of the editor] the above link may be dead after the end of the auction on the eBay' site. (Paris) 16 December 2003 Is that guy joking ? He said they are from the same family and he tries to make me bid on" unknown soldiers" !!! Note that both pictures are 1940-today / 1940's WWII. So I presume that if they are related to us you might recognise them. [Note of the editor] the above links may be dead after the end of the auction on the eBay' site. Anyway, could you tell me which family you are speaking of ? Are they Cavey or King ? I have been unable to find more Caveys pictures on your eBay store than the one I am already bidding on. Can you point me a link or more ? I see you are bidding on the CAVEY FAMILY PHOTOGRAPHS on my ebay site sports-ink. I just want to let you know that I have more photos of the cavey family at my EBAY STORE user ID 99cent-comics. All the photos listed are from the same family. I will also be adding more asap. I wondered who was "daisy102" ? As said previously, I am not interested by these pictures myself : my links with Nathan and Mary Cavey , even if actual, are as close as the link we all have with Cavey the Caveman... (at least, far far deep in the past). Therefore, the reason why I have bidden was to hold these pictures into our family circle. I know that Donald is also interested by them because Nathan was his GGGGrandfathers , brother to Reuben Cavey from which he directly descend. I understand that Donald and yourself are close cousins. Keep in mind that if you outbid against each other the winner will be... the seller. It's up to you, now to win the auction (which I will continue to look at, just in case). At the end of the auction (12/19/03), assuming I'm the winner, my idea was to give the Bill's address for delivery. However, as Bill no longer has a web access, he is not aware of the eBay pictures story. Consequently he will be surprised to receive the pictures from an unknown person (the seller). My question is what is the best solution ? To give Bill's address for delivery to the seller or to give Sharon's address so that she can explain to Bill what has happen ? I had also the idea to give Niki's address because of the great job she has done when scanning the pictures from BIll (those which already are on MyFamily.com) but as she lives in Virginia, I assume that it's more difficult for her to visit Bill. Sharon and Niki, let me know what to do and send to me your home address so that I can give it to the seller. Have in mind that the auctions end the next 3 days. I have bid on the picture of Nathan Cavey and Mary Frost. I'm not interested in the others. Nathan was a brother to my great-great-great grandfather William and Mary was a sister to my g-g-g grandmother Catherine Frost. Brothers of one family married sisters of another. I thought I would let you know that someone in the loop was interested in owning this picture. 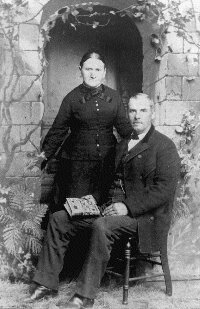 Subject: [Cavey Family] Re: CAVEY FAMILY PHOTOGRAPHS ON EBAY! > be listed, some will be in sets. He just cut and paste the same mail... Not so stupid this guy ! What toubles me is "all the photos there are from the same family"
Hello, First let me tell you I have recieved sevel requests about the Cavey photos from what seem to be your relatives too. If you look in my 99cent-comics ebay store all the photos there are from the same family. I do have more to be listed, some will be in sets. There is also a large batch of reprint photos too. I relisted the photos you asked about in my alternate ebay site SPORTS-INK. Here are the item #'s of the new listing. If you have any questions you can also write me at sportsink99@hotmail.com. "We expect too much at Christmas. It's got to be magical. It's got go right. Feasting. Fun. The perfect present. All that anticipation. Take it easy. Love's the thing. The rest is tinsel." (Paris) 12 Decemberr 2003 All! I've just bidden on eBay to avoid these pictures to be bought by some one outside our circle (even if he is a Cavey). I suggest that we avoid to bid against each others. Nevertheless, the seller does not want to sell outside of the US. 1- I'm the only bidder. I will pay with PayPal (I've an account there) and give the address of Don for delivery. 2- Don wait for the last minutes to outbid (of course I'll let him win). 1- To make this guy believe that his interest is to put the other pictures of the family on eBay (and we will get them). Harsh treatment pays no dividends (in France we say : "one cannot catch a bee with vinegar). 2- To have the pictures at the lowest cost. As he says he have "received several requests about the Cavey photos from what seem to be your relatives too". "I would suggest that Donald and Sharon let him know that you do not plan to bid againts each other ;. Have in mind that the only thing this guy wants is to make as much money as possible with OUR family pictures..."
A better strategy to make this guy put on eBay the pictures he hold on and not to overpay ? Looking forward to your opinion, given that, right now I'm in position to win but that these pictures will, in any case, stay at Baltimore where they have there right place. First let me tell you I have recieved sevel requests about the Cavey photos from what seem to be your relatives too. If you look in my 99cent-comics ebay store all the photos there are from the same family. I do have more to be listed, some will be in sets. There is also a large batch of reprint photos too. Cavey pictures are now being listed on e-bay #3260414159. If someone wants me to bid please let me know! After reading this guys feedback, I really don't trust him. He sent me an e-mail showing 3 pictures that he now has up for sale. I hate to sound nosey, but who is this guy and what is his seller's ID, can't we get Ebay to stop him selling personal family photos that are not his? I am curious to see what he else he is trying to sell. Can someone post a link? I think that there is points which still needs to be clarifyed. How does he/she knows that they are pictures of Caveys ? Why did he/she sent to me the link to the pictures (not only the Cavey but also Frederick King and Mary Ann Bowers) ? I can't beleive that he got them without knowing who is the seller... (which, obviously is a Cavey). Just Curious. Has anyone found out where the ebay seller's shop is located? If in Baltimore, I would be interested in knowing where, and if he would be interested in having family visit him at the shop and purchase the photo's directly from him. (Paris) 25 November 2003 Yes, Donald, I've seen your post and the one of Sharon as well. This person may have an interresting deposit to explore. I would be on the other side of the Ocean at the moment : it's exiting ! [Note of the editor] : Mail sent by Sharon to the seller. [Note of the editor] : Mail received by Donald from the seller. Yes I did get these photos from the Baltimore area. I do have several Cavey pics listed in my store and I will add some more in the near future. I'll have to check to see if this one is still available..
We have not received the mail you forwarded. I assume that you forwarded it attached to the mail. This list does not accept attachements to avoid virus spreading. Can you resent it directly in the body of the mail ? (you can use your" reply" button and replace the addres of the sender by caveys@yahoogroups.com. b) how they ended up in a yard sale. I got a reply from the person who is selling Cavey Family pictures on EBAY. He/She stated that he bought them at a yard sale!!! This just keeps getting weirder and weirder. He also said he has more Cavey pictures that he will be selling!!!! I really don't know what to make of this! (Paris) 25 November 2003 Of course I trust you when you explain how you got the pictures from Bill. 1- at the end of the 1800s and the beginning of the 1900s, it was usual to take pictures and print only one sample because of the price. Of course, it was possible to print several samples but as this was expensive that was not so frequent. The fashion was to print pictures in sepia color as are the pictures on eBay. This makes me think that these pictures are the actual original. 2- it was, and it is still, possible to ask for a photo laboratory to re-print an ancien picture. This can easily be done if you have the film. This can also be done without the film. In that case the laboratory takes a picture of the original. Quite easy to do. We did this several times in my family with original pictures owned by my mother or by her sisters in order to give a sample to the other sisters. In the 1920s the fashion was set to print the pictures in black and white, as the "originals" from Bill has. My assumption is that, even if Bill owns actual pictures, they can be such a reprint. Obviously, I can't be affirmative, but from an historical point of view, the order for the colors of the pictures is first :sepia, later : black and white. Therefore, my opinion is that the pictures to be sold on eBay are the ones from were the pictures owned by Bill come from. This is my humble contribution to the debate. These pictures on the website.. Are the orig photos.. I scanned them in myself.. And at the reunion, gave them back to Bill Norris.. So..
How this man has these photos is quite a mystery to me..
Hmmm If he can send them to me.. I can return them to Debra Gair Bill's Daughter.. The rightful owner of these orig photos. I will try to contact Niki and see if she knows any of the answers as far as where Bill got his pictures (copies). If nothing else maybe she can contact Bill's daughter and she can ask him. I was scared that someone who had acess to our sight might be trying to sell copies but now it doesn't sound like that. This is very strange! I definitely share your analyse and questions, Donald. My assumtion is that they are original. In the early 1990's pictures where printed sepia colored. The ones Bill owns might be a reprint. My thought is that it's easier and more coherent to get these pictures from Maryland than from this side of the Ocean as they are pictures of members of your family tree. I'm not surprised to find other samples of pictures we already have : even in the early 1900's the pictures were printed more than once to be distributed to the family members. 1- where did they came from ? Do we have an unknown relative previously owner of these samples ? The seller himself ? 2- the samples that are to be sold are sepia while the Bill's samples are white and black (a reprint ?). 3- how did the eBay seller had the idea to write to me ? One picture is clearly a Cavey but what about the two others (King and Browers) ? I'm waiting for a reply from Thomas Moore and shall let you know. The e-bay picture appears to be the original, and Bill's submitted picture appears to be a copy. Where did Bill get his copy? How did Tom contact you? Where is the seller from? How did the seller get the picture? 1- where did these pictures come from. If the pictures are not the originals you can buy a copy much cheaper off of the Cavey Family page. Has anyone found out who this person is and how they got the pictures? I am attempting to buy the picture so that it can remain in the family. Hopefully we can find out why it was put up for sale. 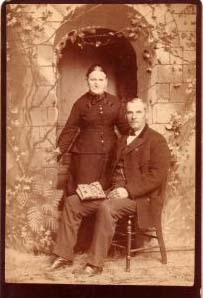 I find it strange that someone would sell a picture of their great grand parents, especially since they were into genealogy! (Paris) 24 November 2003 All! For your information, find attached the mail I've sent to a Thomas Moore who is selling three pictures that are already on this site. [Note of the editor] : here is the mail I have sent to the seller. I would be interested by the item Titled "NATHAN & MARY CAVEY PORTRAIT EARLY 1900'S!" and the one titled "FREDERICK & MARY KING PORTRAITS EARLY 1900'S!" as well. The owner of the original pictures is known to be one of our members. I have attached a copy of these pictures in electronic format. I agree to pay 19.99 USD for the first item and 39.99 USD for the second + shipment for France (Via USPS MAIL) . However, this implies that you accept BidPay because it's a true stuff to send payments in USD from Europe now that our money is EUR. If you agree with this solution I would suggest that you sell these pictures again with a "buy Now" option and that you send a mail to me so that I can immediately bid on it. If you disagree, let us know : we will try to find a way to buy them directly from the US. Finally do you recall from whom you got these pictures ? The owner is probably an unknown member of our familly. The Cavey Family Worldwide Society Webmaster. [Note of the editor] : Mail sent by Donald to the seller. Where did you aquire the Cavey photograph? Are you from the Baltimore area? Is the picture still for sale? You have got to be kidding!!! Does anyone know about it?!?!??! This is really upsetting. Unless the owner..Bill Norris decided to sell it. Anyone have any ideas about what to do? Anyone that has any information about how Cavey family pictures are showing up on ebay please let us all know!!!! (Paris) 23 November 2003 I've no idea of if it was in use to made sevral copies of the same picture in the past. It could be of some interrest to learn from where this picture comes. The seller seems to know who is on the picture. He may have some link with you (us). It is strange, that this picture is up for sale on e-bay (Nathan Cavey & Mary A Frost Cavey). (Paris) 22 November 2003 All! I've received this mail which may be of some interest for the Marylanders Caveys. I'm not selling anything, just trying to connect people to their photos.